As a leader of Chicago's figurative movement in the 1950s, Leon Golub challenged the dominant styles of that time, Abstract Expressionism and Pop Art. Described as an existential and activist painter, Golub has recently regained recognition for his large-scale, politically charged works that directly address issues of war, racism, sexism and power. Political terror and man's abuse of power are the primary subjects rendered in his monumental and highly topical paintings. 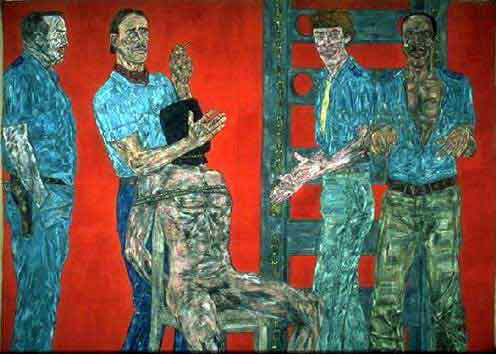 Leon Golub's work is about power and the recurring misuse of power through violence, not as an isolated inhuman phenomenon, but as an expression of organized, often state-sponsored, oppression and brutality. This web site and all of its contents are copyright protected 1998-2019 by Jerry De La Cruz. Nothing is to be reproduced in any form without written permission.